I think there is a distinction between “agility” and “agile” that we are both glossing over. Agile architecture (or more properly “agile architecting”) is architecture that takes the “Agile manifesto” seriously. Agile architecture is a (software development) process. Agility is a property of systems or enterprises. You can architect for agility without doing it in an agile fashion, and vice versa. So the process can be agile, and the resulting architecture have no agility. I take it that a key point of any system or enterprise architecture is designing in those points of flexibility that support desires for enterprise agility, and designing in points of inflexibility where the business does not desire agility. I understand what Doug is hinting to. It is important and something I have not yet addressed. So I’ll give it a try. 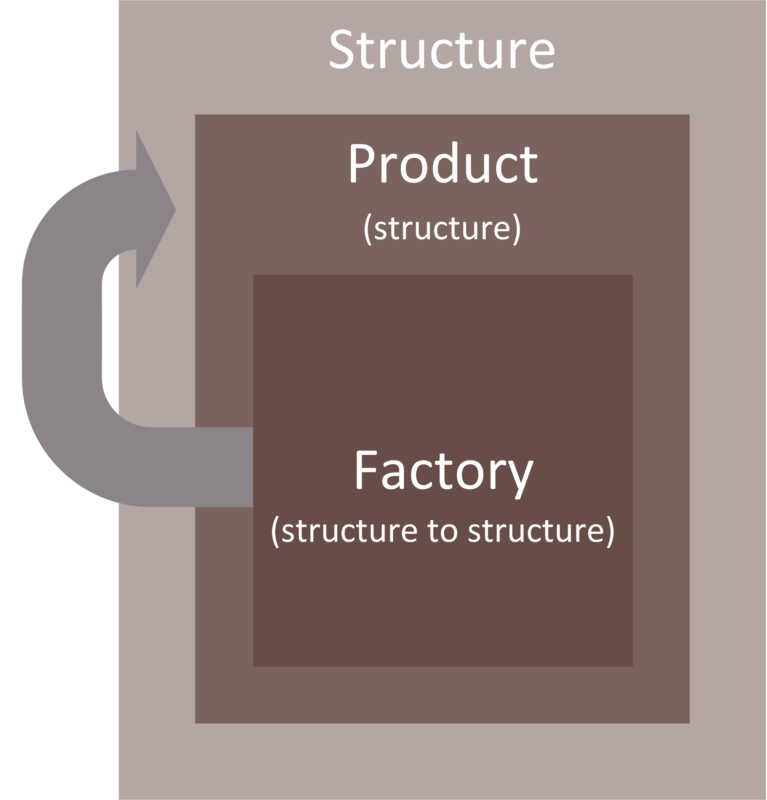 “Structure to structure” is the factory, the factory that produces the “structure” which is the product. The factory represents the structuring competence. That competence can be agile or not, independent of the characteristics of the product, as Doug is rightfully arguing. For an enterprise, the factory is the competence that develops the enterprise structure, and indeed often part of the product itself. When making this concrete with the example of an agile development competency, the factory structure is what has been institutionalized in a social system, contained within the enterprise, including all the support systems that have been installed for the purpose as well. Nonetheless, the factory can be very unstructured, being the counterpart of craftsmanship that was applied in building the first automobiles more than a century ago. The factory introduces another interesting question as to how it is positioned with regard to orders of agility. Clearly the factory can be very agile in producing an ineffective product, a fact often forgotten.